All 15 units of the Eastern Region have developed at least one garden – some have as many as 14. Selected gardens offer guided tours and all are highlighted by educational signs. Native Plant and Pollinator gardens are sources for local native seeds for restoration, as well as sites for interpretation. Pollinators include ants, bats, bees, beetles, birds, butterflies, moths and wasps. In addition to providing nectar and larval food to pollinators, these gardens also serve as rain collectors, slowly releasing rain water into the ground. They also provide habitat for wildlife, and serve as living classrooms for local students and the public. They tell the important story of the significance of our native flora, pollinators and pollination. Many volunteers and visitors are affected by the ecosystem benefits provided by the Native Plant and Pollinator gardens, and are inspired to use the skills they honed there in their own backyard pollinator gardens. Most gardens include several species of wildflowers and grasses. The gardens offer a close-up view of native wildflowers and pollinators at work. The gardens provide habitat and pollen and nectar resources for native insects and hummingbirds. Visitors to the Chequamegon-Nicolet National Forest headquarters’ garden will catch a glimpse of barrens strawberries, bee balm and golden rod. Great Divide garden of the Chequamegon-Nicolet National Forest features Eastern bluebird houses. Even in the winter, the gardens are providing seeds for birds. At the Park Falls Office, numerous pollinators have been spotted since installation of the gardens, including the monarch caterpillar. Gardens feature a mix of native fobs, shrubs, grasses and seed; examples include common butterfly milkweed, hazelnut, little bluestem and big bluestem. A lot of the gardens in the region feature rain barrels that capture rain water to hydrate the gardens and bird and butterfly houses. Bowman Lake Pollinator garden on the Huron-Manistee National Forest is a registered Monarch Waystation. Nearly 10,000 people visit the Lake Michigan Recreation Area garden of the Manistee National Forest every year. The Huron-Manistee’s Lumberman’s monument garden overlooking the beautiful Au Sable River, has over 30 native nectar and hosts plants for pollinators, such as cardinal flower and northern blazing star. Don’t be afraid to buzz around your local national forest, who knows, you might see a pollinator! 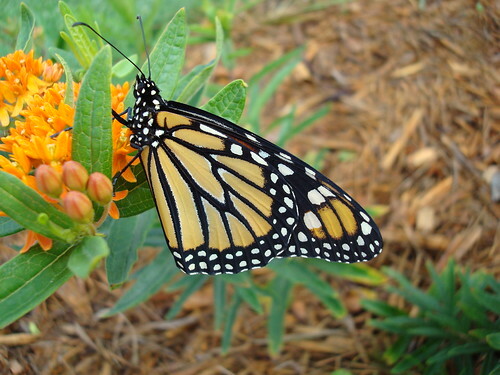 This is a close up view of a Monarch butterfly on a butterfly weed plant. Monarchs and caterpillars are regulars at the Cranberry Mountain Nature Center Native Plant and Pollinator Garden in Richwood, WV. U.S. Forest Service photo by Rosanna Springston. Agricultural Extension Agent with the Chatham County Center of North Carolina Cooperative Extension has also shared some tips for creating a Pollinator Paradise garden, which might interest gardeners @ http://blogs.extension.org/mastergardener/2013/06/18/create-a-pollinato…. She has great photos to share as well. Thanks for sharing this post -- it's a good reminder to look for inspiration at your local forest service and parks, as well. Wonderful to see the Forest Service promoting native plants and their pollinators. We at The Native Plant Center in New York do the same. 1) Who is the staff person in charge of this program and contact info? 2)Do you have a speaker's bureau or presentation on this topic? 3) Where can we see some of your Native Plant and Pollinator Gardens in the New York/New Jersey/Connecticut area? I live in Shawnee, OK. I see none of this here. Where are these walking trails/natural displays shown here located and how close to my area. Thank you. I am waiting for legislation to protect my family and everyone else. USDA start protecting us. How can I receive multiple copies of the brochure regarding pollinator gardens by Susan Reel of Lolo National Forest in Fort Missoula, Montana? I am chair of the Plainfield, NH Conservation Commission and we wish to encourage our townspeople to add pollinator gardens to the landscape. We are located along the Connecticutt River just south of Hanover, NH and Norwich, VT.